1. Who is your toughest competitor on the track? I would have to say Peter Portante. 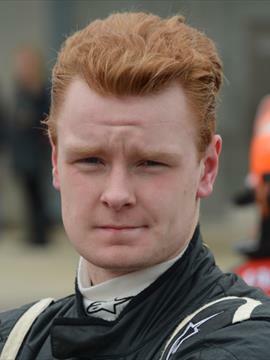 Peter and I started off as rookies in USF2000 on the same team last year, with relatively the same skill level. Because of this we were always battling for the same positions and more often than not things got quite heated. Continuing in 2014, Peter switched to a different team but our rivalry was still very much there. We continued to improve at the same rate and continued to race closely with one another throughout all of 2014. We have had our incidents and our disagreements over the past 2 years racing but the mutual respect is still there. 2. Outside of motorsports, what is your favorite sport to watch? Football! The good American kind! Nothing I love more than cheering on my Seattle Seahawks on an NFL Sunday. 3. In regards to racing, what is the biggest lesson you learned in 2014? The biggest lesson I’ve learned this year is that team chemistry is incredibly important, even in racing. My team this year had plenty of personnel changes starting at the end of 2013 and it changed the team dynamic for 2014. There was nothing negative about our environment but I don’t feel like the same type of “good vibes” environment was in place this year. I had 4 different teammates this year, and 3 different engineers. I must admit that I did struggle to create a good working relationship with both engineer and driver. 4. What is the coolest thing a fan has ever done for you? This year in Toronto I had an 11 year old boy seek me out and find me in the paddock. He had got an autograph and a picture with me at the 2013 event and wanted to come back to see his favorite driver! I was really humbled by this experience and now I’ll always remember him. 5. What is your favorite race track and why? Road Atlanta, thats an easy one. I first got to drive it this year in a Formula Atlantic car and I was blown away by how fast it was. Turn 1 at 130+ MPH is bravery at its finest and the hard braking into the chicane will never get old. I drove it in a F2000 car as well and it was mega in that car as well. Hopefully soon I’ll be there for Petit LeMans!